They are known by many names. In Australia they’re affectionately called ‘pokies’ , the US like to call them slot machines, and in the UK they’re referred to as fruit machines. Whatever their title the precursor to the modern day poker machine games made its debut in Brooklyn in 1891. Loosely based on the winning hands of poker (hence the name) the machine consisted of a series of drums with 50 card faces painted on them. A handle was pulled and the drums spun. If you were lucky enough to score a winning hand you received a prize and it wasn’t what you would expect. The first machines did not give out money, but instead you would get a free drink or cigar for your investment. These first machines were created by Sittman and Pitt but not long after a man by the name of Charles Augustus Fey went on to create machine with a somewhat simplified design that was capable of paying out real money for a win. Dubbed the “Liberty Bell” due to the symbol of a cracked bell used to line up a winning hand, Fey went on to create a revolution in gaming machines. Despite a rocky start, mostly due to anti-gambling groups and government intervention, the modern day poker machine can be seen lining the rooms of casinos, pubs, and clubs the world over – and business is booming. As the Internet grew and became available to most of the world it didn’t take long for companies like Microgaming to jump in on the ground floor and create online versions of these slot machines. Thanks to Microgaming and websites such as Spin Palace, All Slots, and Jackpot City, the gambling enthusiast doesn’t even have to step out of their home to indulge in their hobby, and can in fact even have a punt with the real money pokies while sitting on the train using their mobile phone. Slot machines have become so popular in the last 10 years that the land based income they generate totals almost 80% of the revenue. 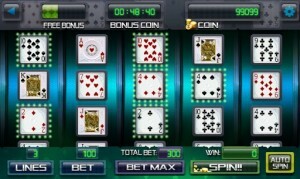 Online versions of these poker machine games are likewise on the rise and are proving to be extremely popular. Given the convenience, global accessibility, innovative and fun designs, plus the ease of electronic funds transfer their popularity isn’t likely to wane anytime soon.